The idea of life and rebirth can be symbolized with an Egyptian Ankh tattoo. This hieroglyphic symbol was used by the ancient Egyptians to represent eternal life, rebirth and the union of male and female. It is a theme which is repeated throughout centuries of Egyptian art. The Egyptian ankh can be used alone or in conjunction with other symbols to form the design of a tattoo. At first glance, the ankh looks like a modified cross with a loop at the top. In tomb paintings and on Egyptian works of art, the ankh may be held by a powerful official such as Pharaoh or member of the royal family. The ankh can also be interpreted as symbolic of the union of man and woman, and the blessing of life found in the children of that union. It is often depicted as being held or bestowed by the Egyptian gods, which is thought to symbolize birth and rebirth. It is often combined with other hieroglyphic characters as a part of a message or theme. Almost any area of the body could be considered appropriate for an Egyptian ankh tattoo. Choosing your placement depends upon the size of the finished piece. The simple lines of the design translate well in both small and large tattoos. As an Egyptian tattoo, the ankh is packed with enough symbolism and design to stand alone. It can also be incorporated into a larger design, combined with additional symbols for a powerful, personal message. A simple, solid color ankh is the most basic Egyptian Ankh tattoo possible. This design works in both large and small areas. Discreet locations for a small ankh tattoo might include behind an ear, on top of the foot, inside of the wrist or on a hip. Larger locations include calves, shoulders and the back. A plain ankh can always be surrounded by other symbols later, forming the foundation of a larger tattoo. Egyptian color symbolism focuses around the six colors of the Egyptian palette: green, red, blue, yellow, black and white. Green is a color associated with fertility, and this color can be paired with the ankh in a tattoo representing new life. Dark blue is symbolic of rebirth, working well with the ankh's meaning in a design. Black, the simplest of tattoo colors, is symbolic of the underworld and when combined with the ankh creates an image of the cycle of death, life and rebirth. A tattoo of an ornate or royal ankh can symbolize more than just rebirth. Elaborate ankhs can be seen in tomb paintings and on sarcophagi dating back to ancient Egypt. Including other elements of ancient Egyptian culture within an ankh tattoo adds to the meaning. Symbols such as scarabs and sheaves of wheat are present on Egyptian ankhs and can be incorporated into a tattoo. Hieroglyphic writing can also be added to an ankh, personalizing the tattoo even further. The ankh was a hieroglyphic character and is often found paired with other symbols and characters to add context and meaning to the glyph. Combining symbols in a tattoo will add to the meaning of the design. 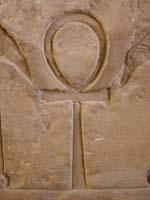 In Egyptian art, the ankh is often combined with other symbols and hieroglyphics. The ankh is often seen as being bestowed by a god or goddess. Isis is a popular goddess to depict as bestowing the ankh for women, and for men Anubis is shown administering the ankh. Combining the symbolism of a god or goddess with the ankh combines the symbolism of the god's function with the eternal life of the ankh. Scarabs represent transformation and change in Egyptian culture. They are often found paired with the ankh. Artistic representations of scarabs often have ankhs carved onto the wings and head of the shape, combining transformation and eternal life into a potent symbol for rebirth. This combination of symbols translates well into a tattoo design. Since ankhs are a hieroglyphic character, they can also be combined with other characters to form a message. Egyptian writing can be combined with names contained in a cartouche, a royal enclosure denoting a name of great importance. Combining the ankh with other Egyptian characters will add additional meaning to a tattoo. The Egyptian ankh is an excellent symbol for both small and large tattoos, since the balance of the design will hold detail well at any scale. Choosing an ankh as a design or a part of a larger piece adds a touch of history and deep meaning to your tattoo.